Polish media are reporting the death of Jerzy Katlewicz, long-serving music director of the philharmonic orchestra in Krakow. Katlewicz, who was 88, conducted premieres by Gorecki and Penderecki during his directorship in Krakow, which lasted from 1968 to 1980. He also served for three years as artistic director of the Noordhollands philharmonic in Haarlem, Netherlands. 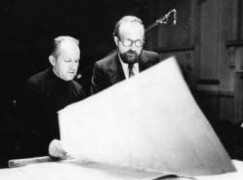 His was the first recording of Gorecki’s million-selling third symphony. That’s a pretty big score they are looking at ! !